Giada Technology, the industry leader in embedded systems and expert in server technology, today officially announces the N60E-O compact server for warm cloud storage applications powered by Intel Xeon-D processors which offer scalable performance on a tiny form factor. Balancing value, performance and integration, the Giada N60E-O features an onboard Broadwell-DE based Xeon-D processor which is intended for entry-level enterprise storage applications particularly warm data storage. The Xeon D-1540 features 8-cores with 16 threads with an impressive TDP rating of 45W offering a great balance of performance and power draw making for a highly efficient setup. The Giada N60E-O features the compact mini-ITX form factor (170x170 mm) for compact chassis but is compatible with most general tower-types, rack-mounted cases and mini NAS server chassis. 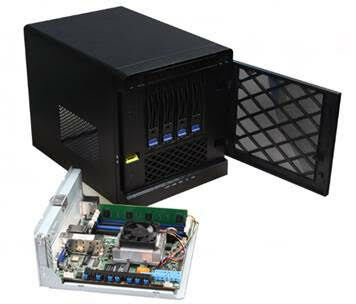 Users can adapt the Giada N60E-O to their particularly dimensions without shifting chassis of their server. Besides sporting a dual Gigabit Ethernet RJ45 via the Intel i210 controller, the Giada N60E-O also sports two 10-Gigabit (10Gbps) SFP+ connectivity via SOC which allows greater bandwidth and transfer efficiency. Users can now achieve higher bandwidth with less latency. 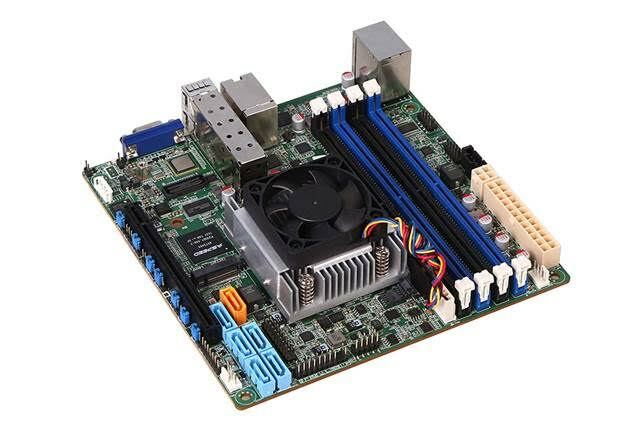 A full-speed PCI-E 3.0 (x16 speed) expansion slot is present onboard for customers to upgrade their system with a fully-functional graphics card, HBA card, RAID card or network card. The Giada N60E-O features six (6) SATAIII 6Gbps connectors for maximum storage capacity. Users can also update to a 12G solution via the PCI-E expansion slot and get more performance from the Giada N60E-O in dense storage applications. The onboard M.2 slot expands the internal storage for faster responsiveness and system transfer and supports both SATA and PCI-E with up to 4GB/s of transfer speed. Two USB3.0 ports also offer expansion capabilities for storage and are perfect for maintenance and internal system backups via USB3.0 devices. Giada assembles the N60E-O motherboard with choice components configured by Giada engineers to deliver high-efficiency. The Giada N60E-O features solid capacitors that are durability tested up to 12,000 hours under 105oC temperatures which is in excess of the heat generated by standard operation. Manage your Giada N60E-O remotely via IMPI 2.0, even in an offline or suspended state via KVM modules that feature browser support which provides annual remote monitoring and diagnosis through an easy-to-use web interface (supported by N60E-O with Intel Xeon-D 1520 and higher). Intended for entry-level enterprise applications that demand high cost-benefit ratio particularly for storage solutions such as NAS, SAN or IaaS applications. The small footprint of the Giada N60E-O makes it perfect for compact installations where it complements the inherent efficiency of the processor. The processor itself which is an onboard solution allows for rapid deployment for instances wherein a quick solution for the intended applications need to be deployed instantly. SMEs and other scenarios requiring a solution for warm data or files that aren’t heavily accessed on a frequent basis will benefit greatly on the optimized architecture of the Giada N60E-O’s Xeon-D processor. The Xeon-D processor’s low power consumption and heat output makes it a highly efficient and low maintenance part, reducing the need for servicing and is completely designed by Giada engineers for 24/7 rock-solid operation. Tested with durability and stability in mind, Giada designs the N60E-O server board with dedicated components to assist in achieving this goal. Design to scale with growing business storage needs, the Giada N60E-O features support for up to six SATAIII devices controlled by the onboard SoC. 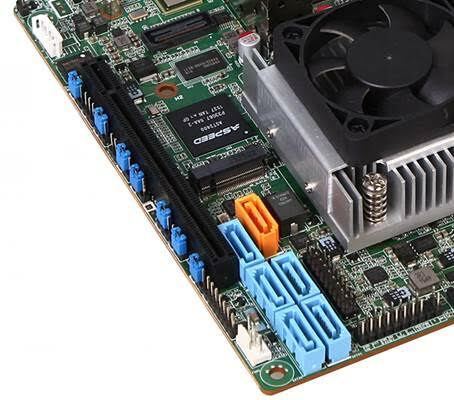 Further storage can be added via the onboard M.2 slot supporting up to x4 PCI-E 3.0 speeds and also via the PCI-E x16 slot that can take in add-in board to allow expansion for more storage SATA, SAS, SCSI or whichever controller your application or infrastructure requires.